Priya is a 37 year old woman who works as a house help for new mothers & new born babies. She has been working hard with her 40 year old husband (who works at a garage) to support the treatment for their 2 teenage daughters Daisy (18 years old) and Mercy (19 years old) who suffer from Epilepsy from birth. Both Daisy and Mercy have special needs that include intensive care, medicines, diapers, supplements, nutritious food which is quite expensive. Priya has been working very hard to support the needs of her daughters. Recently, her husband fainted and fell down one day. On visiting the doctor, he was diagnosed with infection in his lungs and has paralysed stroke and has been admitted in NIMHANS for last 2 months and has been unconscious and doesn't recongnize anyone anymore. 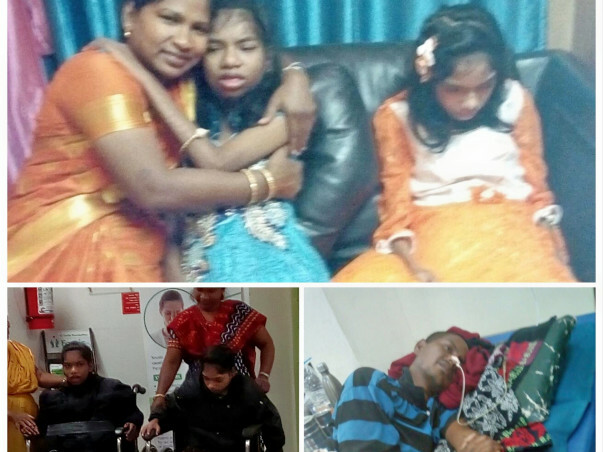 Priya is really struggling to make ends meet and unable to go to work as she is the sole care taker for her unconscious husband admitted in the hospital and her two daughters at home. Please help Priya with whatever less or more you can so she can continue with the medical treatment for her daughter and husband. And also she can keep a house help which will allow her to work and earn a livelihood for her family. Firstly, thanks for your support. We have collected 30,000 INR so far but have a long way to go still. It would be great if you can share this with your contacts and spread the word. Appreciate all your help and will keep you posted. Thanks again for your generosity for Priya and her family.